In general, when computing the eigenvalues of symmetric matrices, a matrix is tridiagonalized using some orthogonal transformation. The Householder transformation, which is a tridiagonalization method, is accurate and stable for dense matrices, but is not applicable to sparse matrices because of the required memory space. The Lanczos and Arnoldi methods are also used for tridiagonalization and are applicable to sparse matrices, but these methods are sensitive to computational errors. In order to obtain a stable algorithm, it is necessary to apply numerous techniques to the original algorithm, or to simply use accurate arithmetic in the original algorithm. In floating-point arithmetic, computation errors are unavoidable, but can be reduced by using high-precision arithmetic, such as double-double (DD) arithmetic or quad-double (QD) arithmetic. In the present study, we compare double, double-double, and quad-double arithmetic for three tridiagonalization methods; the Householder method, the Lanczos method, and the Arnoldi method. To evaluate the robustness of these methods, we applied them to dense matrices that are appropriate for the Householder method. It was found that using high-precision arithmetic, the Arnoldi method can produce good tridiagonal matrices for some problems whereas the Lanczos method cannot. 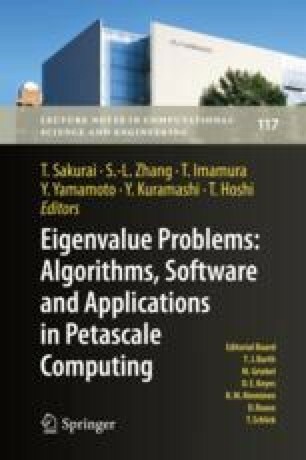 The authors would like to thank the reviewers for their careful reading and much helpful suggestions, and Mr. Takeru Shiiba in Tokyo University of Science for his kind support in numerical experiments. The present study was supported by the Grant-in-Aid for Scientific Research (C) No. 25330141 from the Japan Society for the Promotion of Science.